The US Government is claiming it has definitive ‘evidence’ to prove the Assad Government has used chemical weapons (CW) “against its own people”. Chemical weapons are abhorrent, indiscriminate and cause massive human suffering. But what, if any, is the strategic gain from the Syrian Arab Army using CW against disparate rebel groups encamped inside densely built civilian areas? 1.) Chemical weapons have a terrible track record as an effective weapon against any type of enemy targeting and deployment is crude and effectiveness is largely determined by the weather, if the wind blows the wrong way, they are useless. CW are also easily negated through simple countermeasures such as gas masks. During the Iran/Iraq war, thousands of chemical shells were used indiscriminately, the effective death rate to enemy combatants was miniscule in comparison to the amount and cost of chemicals used, against other conventional forms of warfare, (which the Syrian Army have in abundance) chemical weapons are ineffective and costly. 2.) The Syrian Government and Armed Forces know from previous US aggression in the region, and since Obama made his infamous “red-line” dictate, that any use of CW would result in an overt US ‘intervention’. (NB: US has been covertly ‘intervening’ in Syria from day one.) Why would the Government or members of the SAA decide to use Sarin at this stage? Particularly considering the SAA has been on the front foot for months, the SAA has routed rebel strong-holds and vital land and highway routes. If anything, Assad’s popularity inside Syria has only increased as the SAA has expanded its territorial gains. 3.) Using CW would undoubtedly alienate the SAA and the Government from the population. Assad is winning ‘hearts and minds’ in Syria. why would he risk it by allowing such recklessness when the Army is winning its chosen battles and gaining public support? 4.) To use CW on such a small-scale, there is absolutely no strategic benefit gained to the SAA. It has far more devastating and terrorising weapons in its arsenal, an SAA Commander relayed this fact to Robert Fisk the last time CW agitprop was being doled out: “why would we use CW when we have Mig fighter jets?”. The US claims 100 -150 people have been killed by Sarin use, (while also claiming it has ‘evidence’ from only two victims.) Yet the UN claims upwards of 90,000 people have been killed in the conflict. (NB: at least half of which are SAA soldiers according to SOHR.) So why risk overt US intervention for the sake of killing 100 people in such small operations? Recently, in both Iraq and Turkey, Al Qaeda cells were found in possession of Sarin and the equipment made to use it, it is no secret the ‘rebels’ just across the border are heavily affiliated with Al Qaeda ideologues and have poured into Syria through Turkey and Iraq. These reports have been almost whitewashed from Western press. After earlier rebel claims of CW use, several reports suggested rebels were in possession of Sarin or a similar agent and had used it in Aleppo on an attack on Syrian Government forces, in which an estimated 15 soldiers died. The Syrian Government immediately reported this incident to the UN and asked for an investigation. Under US pressure, the UN replied that it would only conduct a nation-wide investigation and again, the reports were marginalised, obfuscated and forgotten about. Obviously, to anyone with half a brain, it is clear that the SAA willingly using chemical weapons is suicide. And offers the SAA no short-term, or long-term strategic benefit. This brings us to who directly benefits from false claims of the SAA using CW? The rebels would obviously benefit a great deal from Obama enforcing a No-Fly Zone, and providing direct US military aid. It is well within the rebels interest to frame the Syrian Government to build a pretext for overt US intervention. The timing of these revelations is also highly indicative as to their purpose. As mentioned above, the rebels are losing in a big way inside Syria, supply lines have been cut off, key towns and transit routes have been retaken by the SAA. Rebel numbers and sanctuary are dwindling, if the ‘balance’ were to remain the same, the insurgency would soon be over; permitting Syria could secure its borders to a reasonable extent. The brutal war ending is not what the US and its allies want in Syria. 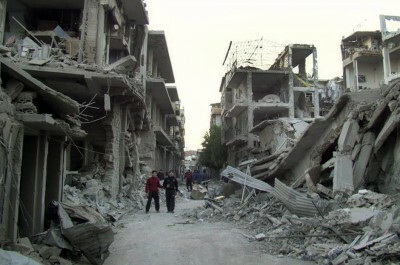 This war has never been about the safety, self-determination or will of the Syrian people. This war has always been about regime change, by any means necessary. Now that US and Gulf proxies are desperately losing, the ‘WMD’ Casus Belli must be utilised once again. Regardless of a lack of public evidence or willingness to believe these outlandish, and tainted claims, the US will persevere and is no doubt already increasing its military supplies to Salafist ‘rebels’, these falsehoods just offer further retrospective legal cover for the illegal proxy-war the United States has waged against Syria. The US Government and Military Industrial Complex cannot be seen to back down in the International Community. When Obama declared “Assad Must Go” he did not envision the Syrian people and state (and, to an extent, their international allies) to stand up and defeat the US led subversive proxy war. Two years later and the insurgency is being crushed, the administration is perplexed, its Gulf clients could not pull off the ‘regime change’ the US military and intelligence community are usually so adept at achieving. Obama administration is lost and has no face-saving policy with which to proceed in removing Assad, so it must pursue the WMD card, knowing that when it is all over, the CW will be in Syria. (unlike Iraq) Whether the Syrian Government actually used them or not will be yesterdays news, who cares, Assad was a “bad man” who “killed his own people” (including tens of thousands of his own soldiers??) and look at all these Chemical Weapons we found!! The ‘media’ and Western leaders again bang the drums for this criminality and ‘intervention’. Will it take another ten years before we are mocked with vapid mea culpa’s and skewed death tolls? Russian MP’s are already stating the ‘evidence’ of CW use is fabricated, we should listen to their advice. We were fooled by Western governmental criminals into aggression and genocide ten years ago, the same is happening now.